... are very important. Both your mind and body are going through a significant transition; you are, in effect, reclaiming your life. Although addiction goes on "automatic pilot," sobriety does not, and must therefore, be made your daily priority. You are not alone-many others have walked, and are now walking, this same path. We offer the following suggestions in an effort to assist you in a wonderful new adventure-sobriety. We define sobriety as the priority of abstaining from alcohol and all other mind-altering drugs. It has been said by many that in early sobriety, things first get real, then they get real different. Reality is indeed a different experience; but it need not he overwhelming. All those who sincerely seek sobriety are welcome as members in any SOS Group. SOS is not a spin-off of any religious or secular group. There is no hidden agenda, as SOS is concerned with achieving and maintaining sobriety (abstinence). SOS seeks only to promote sobriety amongst those who suffer from addictions. As a group, SOS has no opinion on outside matters and does not wish to become entangled in outside controversy. Although sobriety is an individual responsibility, life does not have to be faced alone. The support of other alcoholics and addicts is a vital adjunct to recovery. In SOS, members share experiences, insights, information, strength, and encouragement in friendly, honest, anonymous, and supportive group meetings. To avoid unnecessary entanglements, each SOS group is self-supporting through contributions from its members and refuses outside support. Sobriety is the number one priority in a recovering person's life. As such, he or she must abstain from all drugs or alcohol. Honest, clear, and direct communication of feelings, thoughts, and knowledge aids in recovery and in choosing nondestructive, non-delusional, and rational approaches to living sober and rewarding lives. As knowledge of addiction might cause a person harm or embarrassment in the outside world, SOS guards the anonymity of its membership and the contents of its discussions from those not within the group. SOS encourages the scientific study of addiction in all its aspects. SOS does not limit its outlook to one area of knowledge or theory of addiction. To break the cycle of denial and achieve sobriety, we first acknowledge that we are alcoholics or addicts. We reaffirm this truth daily and accept without reservation the fact that, as clean and sober individuals, we cannot and do not drink or use, no matter what. Since drinking or using is not an option for us, we take whatever steps are necessary to continue our Sobriety Priority lifelong. A quality of life-"the good life"- can be achieved. However, life is also filled with uncertainties. Therefore, we do not drink or use regardless of feelings, circumstances, or conflicts. We share in confidence with each other our thoughts and feelings as sober, clean individuals. Sobriety is our Priority, and we are each responsible for our lives and our sobriety. Attend as many SOS meetings as you can. If you would like, attend other recovery group meetings. Take what you can use from these and leave the rest. Get names and phone numbers from other sober alcoholics/addicts at meetings. Use these phone numbers. Practice calling people when you're feeling okay so that you'll be able to call more easily when you're in need of help. Try putting some simple structure into your life: Get up and get dressed at a regular time, take a walk before or after dinner, etc. Do some reading on alcoholism and addiction from any of the books on the "Recommended Reading" list. Visit a local library or bookstore and see what others they may have to offer. Be gentle with yourself. Sobriety skills aren't developed overnight, so give yourself credit for just not drinking. It does get better. Choose to stay sober one day at a time. You can do for a 24-hour period what you could not conceive of doing for a lifetime. Keep plenty of mineral water, sodas, and/or fruit juices on hand. Prices include shipping and handling. You may order the above three books through the SOS Clearinghouse. Under the Influence by Dr. James Milam and Katherine Ketcham (Bantam Books). Feeling Good: The New Mood Therapy by David D. Burns, M.D. (Signet Books). The Natural History of Alcoholism: Causes, Patterns and Paths to Recovery by Dr. George E. Vailland (Harvard University Press). The Sobriety Priority approach respects the power of "nature" (genetic inheritance, physiological constitution) and of "nurture" (learned habit, behaviors, and associations)by showing how to achieve the initial arrest of cellular addiction and stave off the chronic habits that result from this addiction. 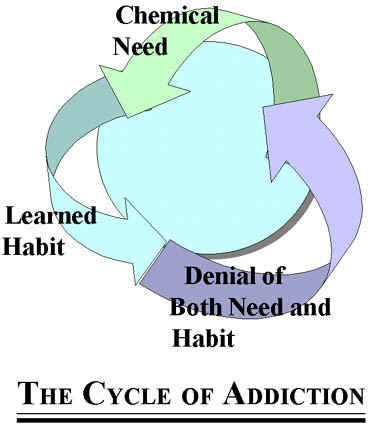 The "cycle of addiction" contains three debilitating elements: chemical need (at the physiological cellular level), learned habit (chronic drinking/using behavior and associations), and denial of both need and habit. The cycle of alcohol addiction usually develops over a period of years. Cycles have been found to be much shorter with other drugs, especially cocaine. In all cases, however, the addiction becomes "Priority One," a separate issue from everything else. And as it progresses, it begins to negate everything else. The cycle of addiction can be successfully replaced by another cycle: the cycle of sobriety. This cycle contains three essential elements: acknowledgment of one's addiction to alcohol or drugs (you may have euphemistically called it "a problem"); acceptance of one's addiction; and prioritization of sobriety as the primary issue in one's life. 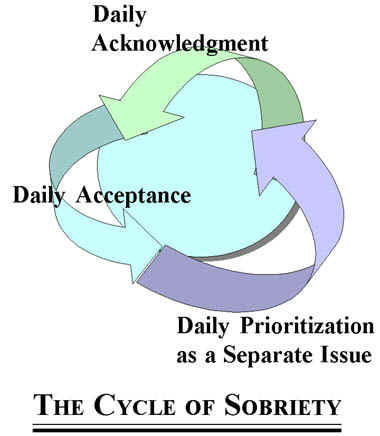 The daily cognitive application of a new "Priority One," the Sobriety Priority, as a separate issue, arrests the cycle of addiction. It frees the sober alcoholic/addict to experience "everything else," by teaching him or her to associate "everything else" with sobriety, not with drinking or using behaviors. The cycle of sobriety remains in place only so long as the sober alcoholic/addict cognitively chooses to continue to acknowledge the existence of his or her arrested addiction(s). The Sobriety Priority, applied daily, gradually weakens booze and drug associations, halting the cycle of addiction, allowing time for new associations to form as one experiences life without addictive chemicals. As one continues to "make peace" with the facts regarding his or her arrested addiction-that is, as one continues to recognize alcohol and drugs as a non-option-one comes to prefer a sober life-style; one longs to preserve it, to respect the arrested chemical addiction, and to protect the new, sober life. Portions of this brochure are excerpted from Unhooked: Staying Sober and Drug-Free.